And now, after centuries of stained tablecloths, finally a scientist at Brandeis University has come up with a solution, albeit one that can’t really be accomplished at home. First, let’s acknowledge that this is a legitimate issue; publications like Wine Spectator have attempted to address it while eventually just throwing up their hands. There are a few different techniques for dealing with the fact that wine – horribly staining wine – tends to drip down the neck while pouring. Some suggest a quick rotation of the bottle at the end. Some wrap a napkin or cloth around it, which doesn’t so much solve the problem as attempt to redirect the stain onto a less important fabric. Others still shove a pourer into the opening, which works, but isn’t very elegant, and also relies on having spare parts lying around. 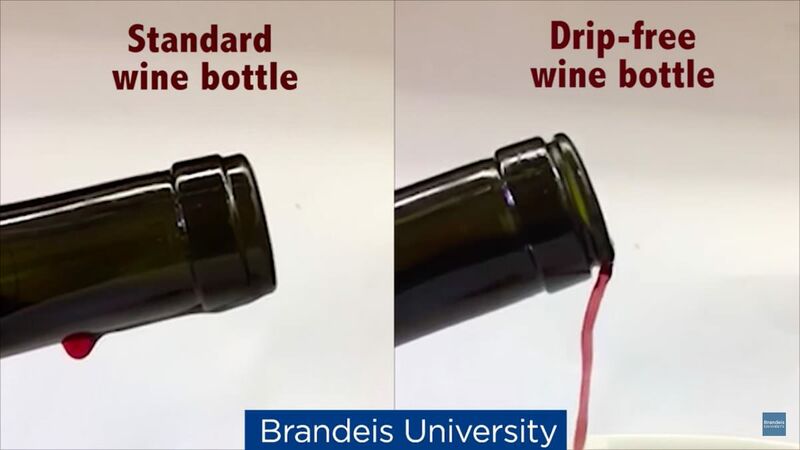 Daniel Perlman, a biophysicist and self-proclaimed wine lover at Brandeis, analyzed the necks of wine bottles to find out exactly why the drip happens. The answer turns out to be pretty simple: water loves glass. In short, the connection between glass and water molecules is stronger than the connection between water molecules to themselves. That means that water – the main ingredient in wine – would rather stick to the glass than to itself, it wants to hang on the neck of the wine bottle and then ruin your tablecloth. But if it’s harder for the wine to run down the neck of the bottle, it would reduce dripping. Perlman’s solution is very simple: a sort of furrow carved around the neck, right below the opening, of about 2mm wide and 1mm deep. This little groove acts as a moat to keep wine from running down the neck; to jump the groove, it’d have to overcome the force of gravity. Too hard! Instead, the wine gives up and falls into your glass where it belongs. Perlman created the wine bottle with the help of a diamond-tipped saw, which means that it would be ill-advised for us non-biophysicists to try this at home. But he says he’s talking to bottle manufacturers to hopefully put his creation into effect.